The ISO file (.iso) is a disk image of all data on a CD, DVD Blu-ray Disc (BD), or any other disc format. MP3 is the compressed audio file supported by many music players. Sometimes, you may want to extract MP3 from ISO files so that you can enjoy the songs on your portable devices on the go. This article will tell you how to convert ISO music CD to MP3 and DVD movie ISO to MP3 format. In order to convert music CD ISO to MP3, you need to install some virtual software to "Mount" the CD. There are many free virtual CD software on the Internet, such as Virtual CloneDrive, MagicDisc, Daemon Tools Lite, etc. Then right click your ISO file and choose "Mount" to mount the file to the virtual drive with the virtual drive program. After that, you can open your Windows Media Player or iTunes to use them to convert ISO to MP3 for free. For more details, please refer to Rip CD to MP3 with Windows Media Player or Rip CD to MP3 with iTunes. If you have got some ISO movie files and the movie contains the songs you like very much. Now you want to extract the music from the ISO files or you just want to get the MP3 audio from DVD so that you can listen to it on your portable devices like iPhone, iPad, iPod, etc. The thing is: How to convert ISO to MP3 file? To convert DVD ISO to MP3, you can use Aimersoft DVD ripper Windows. It supports ripping ISO, DVD (Commercial CSS-protected DVDs included) and IFO files. With it, you can easily convert ISO to popular audio format like MP3, AAC, FLAC, WAV, OGG, etc. Besides, you can convert DVD to all popular video formats, such as WMV, MOV, AVI, FLV, MOV, MKV, MP4, 3GP, etc. for playing on iPhone, iPad, iPod, etc. The equivalent Mac version is Aimersoft DVD converter Mac, which can help you convert ISO to MP3 on Mac (Mountain Lion included). Insert DVD disc into your computer drive after running Aimersoft DVD Ripper. Load ISO files by clicking the "Load DVD" button on the top left. If you have copied the ISO fils to local drive, you can also directly drag and drop them into the mian window of this program. In this step, you will need to select the output format as MP3 and choose the output folder to save your converted MP3 files. 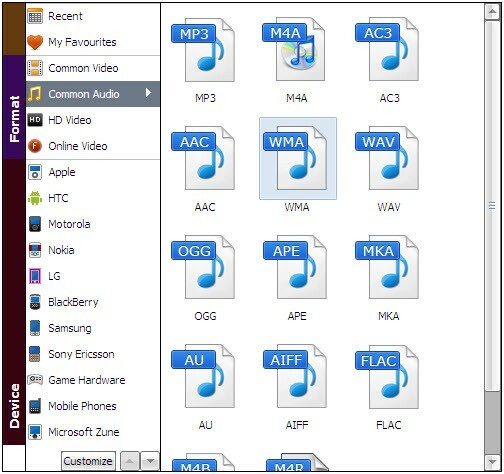 Just note that there are also many other audio output format you can choose from, like FLAC, AC3, AAC, M4R and more. When you finish all settings, simply click "Start" to starting converting ISO to MP3 for playing on MP3 players. After the conversion if finish, you can get the output MP3 files from the designated output folder. Now enjoy the music as you wish! Just get the right version of Aimersoft DVD Ripper and convert ISO to MP3 on Mac and Windows (Including Windows 8) with ease! This happens to me all the time too, I watch a movie and I completely fall in love with a song in the movie, but there's no way for me to listen to it right away, because I don't even know the title. Anyhow to make things simple, instead of having to search the internet for title and stuff, just slip your DVD in your pc, power up your DVD Ripper, and let it do its magic. Converting ISO to MP3 couldn't be any easier. This happens to be by far the best ISO to MP3 converter I have come across. You just need to download this simple software and the conversion takes place in an easy and swift manner. What more, it does not even harm your computer.